Richard L. Morgan has carved a niche as a bestselling author and an authority on older adult ministries and concerns. Now, he chronicles his own transition to a retirement community. Morgan speaks frankly about the losses and realities as he approached his own not-yet-frail "fourth quarter" (after age 75). Drawing from his journals of those sometimes-agonizing months, he takes us through his decision to move to a long-term facility and the first year of settling in. "The retirement community became my home, and I must confront the inevitable illnesses of old age … every day," Morgan writes. "While I could not minimize the difficulties and issues I faced in this new lifestyle, it gave me a view of this life as an insider. I became a participant, not an observer [as before in my ministry]." Morgan addresses the fears of life after 75: loss of health, cognitive ability, short-term memory, independence, and status. Fifty-two scripture passages, meditations, and prayers offer hope for those along this intense pilgrimage. As one reviewer says, "Settling In speaks loudly of the continuing call of a God with hands outstretched, who is always challenging us to further horizons, larger concerns and constantly surprising us with news to love and be loved." 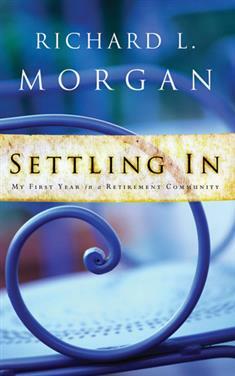 Morgan's soul-baring reflections are invaluable for those considering a move to a retirement community, current residents, their family and friends, and staff of facilities.